Summary (from the inside flap of the book): Detective Rachel Getty trusts her boss, Esa Khattak, implicitly. But she's uneasy at Khattak's tight-lipped secrecy when he asks her to look into Christopher Drayton's death. Drayton's apparently accidental fall from a cliff doesn't seem to warrant a police investigation, particularly not from Rachel and Khattak's team, which handles minority-sensitive cases. But it soon comes to light that Drayton may have been a war criminal with ties to the Srebrenica massacre of 1995. If that's true, any number of people might have had reason to help Drayton to his death, and a murder investigation could have far-reaching ripples. As Rachel and Khattak dig deeper into the life and death of Christopher Drayton, every question seems to lead only to more questions, with no easy answers. Had the specters of Srebrenica returned to haunt Drayton at the end, or had he been keeping secrets of an entirely different nature? Or, after all, did a man just fall to his death from the Bluffs? 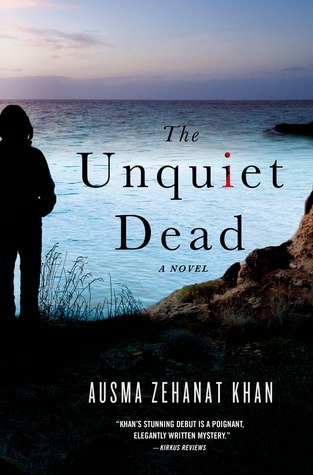 Review: A mystery that is tied to a historical event? Sign me up! I really liked this one and am so glad that it is part of a series (at least that I what I think I heard). I think the two main characters, Rachel and her boss Esa, are great characters. They are part of the Community Policing group in Canada that deals with crimes against refugees, immigrants, and people of color. The crime they are dealing with in this novel doesn't seem to fit their job description: a man has fallen off a cliff and died. But, it turns out he is a Serbian mass murderer from Bosnia. The process of them figuring out the truth combines current day investigation as well as looking back at testimony of muslims whose families suffered at the hands of the Serbs. There are some graphic descriptions of the mass rapes (not the act, but the build-up), beatings, and murders that took place in Bosnia from 1992 to 1995. It is harrowing to be reminded of what human beings can do to one another in the name of religion and nationalism. The supporting characters, both in Canada and in Bosnia, really round out this book. They are interesting, smart, and really bring the book and story together. If you like detective novels and historical fiction, then this book will definitely appeal.